Scale accuracy depends on the way a scale is used and cared for. Weather, use, and wear can change the accuracy of a weighing device, which is why periodic calibration is so essential. Here are a few tips to help you minimize losses from a poorly calibrated scale. Before listing my suggested tips, I want to make sure readers understand just how much seemingly minimal errors can cut into profits over time. 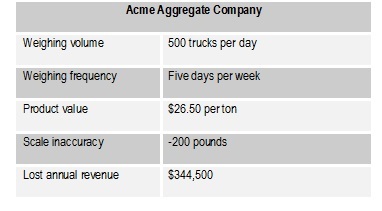 Take the Acme Aggregate Company example shown below, in which two hundred pounds may appear miniscule, since a typical truckload of sand or gravel can exceed 80,000 pounds. However, when one does the math, the truth is revealed – an annual revenue variance of about $345,000. The proper calibration frequency is based on two factors: the requirements of law and the value of the commodity – In other words, how critical is the accuracy of the weighment? Yes, calibrate more often for copper than manure, or if the weight is critical to a process (like for batching, mixing or recipe work). Also calibrate more frequently if the scale is under a mixer or agitator with a lot of vibration, because that is more likely to drive the calibration out of bounds. Most people typically calibrate their scale once a year, just before the state certifier rolls into town to verify the weights on a scale. I really recommend at least twice a year; and consider even more frequent calibration if you have high value commodities or high volume applications. If being off by 20, 40, or 60 pounds makes a big difference to the bottom line, consider monthly calibration, with spot checks in between. An established scale service company typically has its entire inventory of test weights tested and certified annually, in accordance with state weights and measures standards. Beware of service companies that test only a portion of their overall weight inventory each year. Preparing the weights and delivering them to a metrology laboratory for testing requires an enormous amount of time and money, so it may be tempting for some service companies to skip this important step. All too often, weights may be condemned and un-certifiable. Start by verifying with your service provider that their weights have been certified. You will save yourself a lot of headaches by scheduling regular service with an authorized scale calibration firm just prior to state inspection by weights and measurements personnel. Avoid the real risk of red tagging, when the state inspector says the scale is so far out of bounds that it can’t be used for business until it’s remedied. Set up your periodic routine calibration plan with a reputable calibration service company. And make sure the company conducts the inspection in accordance with NIST Handbook 44 regulations for commercial weighing applications. A simple drive over and a sticker will not suffice and could be a total waste of money and time. It is also important that your service provider uses a professional test report process that performs the NIST calculations without the service technician having to perform them. The best systems are application based and reduce test reporting errors ultimately supplying the scale calibration report without human errors. Drive over the vehicle scale with a specialized test vehicle looking for repeatability. Unload a specialized certified weight cart that will travel over each section to ensure all sections weigh exactly the same. 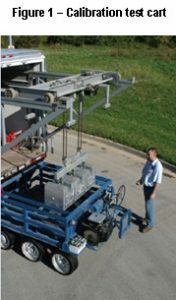 Drop onto the scale up to 25,000 pounds of certified test weights for a final calibration test. Service provider’s Weights and Measures License number. Copy of certified test weight documentation for conformance and traceability. Information on licensed technicians performing test.